Much of Missouri will continue to see high temperatures and high heat indices this week. Last week at least four deaths in the state were believed to have been attributed to heat. 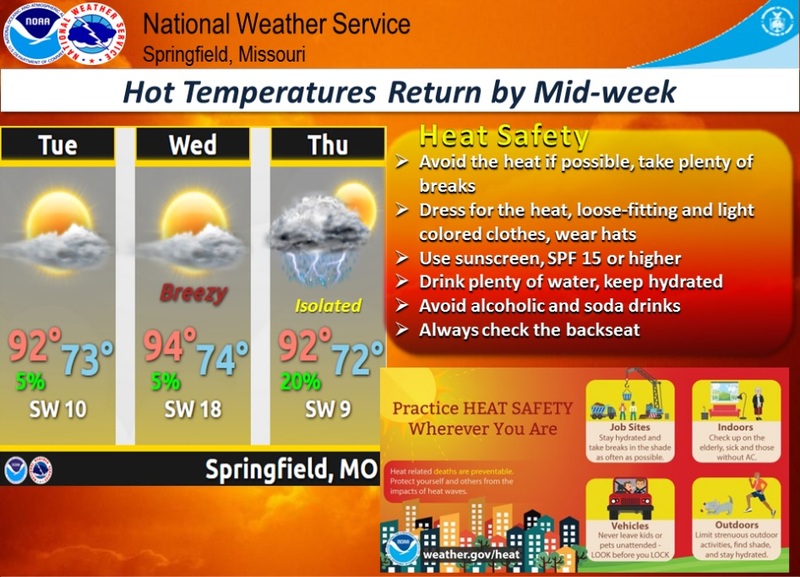 This graphic from the National Weather Service in Springfield shows the outlook for more hot weather in southwest Missouri. University of Missouri emergency physician Chadd Kraus says Missourians should avoid work outside during the hottest part of the day – roughly 10 to 4 – and watch for signs of heat exhaustion. “That’s when we kind of start to have excessive sweating, we might feel faint or dizzy, we might have a little bit of nausea or vomiting, or some muscle cramps. When that happens we really need to get inside right away to a cool area, you need to drink some water, get out of the sun,” said Kraus. Worse still is heat stroke. Kraus says victims of heat stroke need medical attention immediately. He says people should be proactive in fighting heat-related illnesses. Kraus says his E.R. has had some people come in suffering due to heat.